Christmas is coming and finding the best iPhone 4 & 4S accessories is easy, but finding ones that are just totally cool is hard. Not anymore, say hello to the Texas Instruments Pico Projector. This is a brilliant case that allows you to project things straight from your Apple iPhone showing up to a massive 50-inch display. 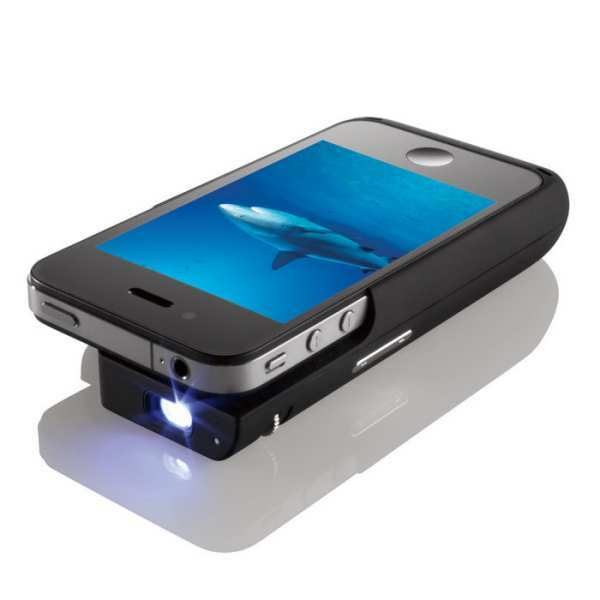 The Pocket Projector for iPhone 4 and 4S is a joint project with both Texas Instruments and Brookstone, the case features super-bright 15-lumen LED projector lamp, 640×360 native display resolution, which is much better than other pico projectors. It comes with a built-in 0.5W speaker for audio, and focus adjustment so that you can play around with the image clarity. Thanks to the Pocket Projector’s built-in 2100mAh battery, it will charge your iPhone via USB connection, when the case has been fully charged it acts as an extended battery for your iDevice. This projector is compatible with a lot of native iOS apps; you could use YouTube, Photos, Videos and many third-party applications. For more information on the $229.99 iPhone pocket projector, please visit Brookstone. Shipping starts November 16th. Heh, a pico projector for an iPhone? This is something new… though very interesting! Pico projectors have always been great accessories for smartphones and many manufacturer make sure they can connect to iphones. Â The aaxa technologies p4 projector that was released last month has 80 lumens compared to the 15 on this brookstone projector and would give a much better image.